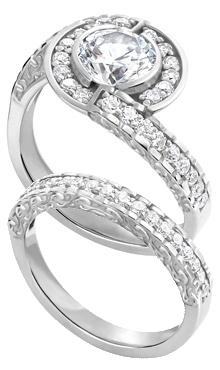 This platinum bypass ring has a bezel setting that can accommodate a round stone of various sizes. If you choose a center diamond ranging in size from .80ct to 1.10ct, the ring will have 16 diamond sidestones that are .015ct each and 10 diamond sidestones that are .01ct each. Each side stone has a color or G-H and clarity of VS. The wedding band has 12 round diamonds that are .01ct each. You choose the center stone from Danforth's inventory.